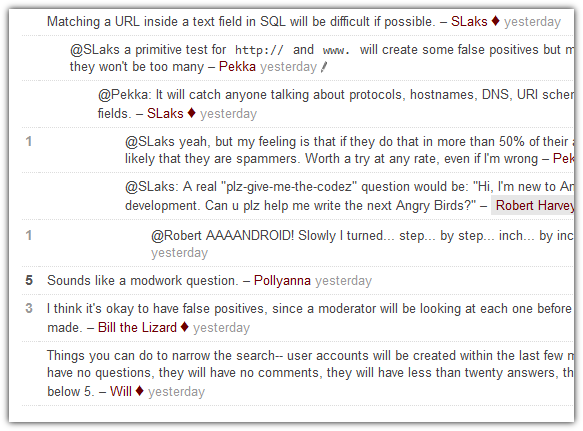 June 6, 2012: Fixed an issue that can cause major problems with chat. December 17, 2013: Fix an incompatibility with the Winter Bash code. Instead of showing comments in chronological order, this user script displays them in a threaded view, making it easier to follow conversations in long comment threads. It uses heuristics similar to the @-reply recognition (but it is a little bit more flexible). It should be noted that this may obviously change the order in which comments are displayed, so you cannot rely on a chronological order anymore. In most cases this doesn't matter, but sometimes it just might. Update 2011/07/10: As suggested by George Edison, now offers a button to undo the threading on a particular post, in case you want to see the comments in their regular order. I'm not 100% happy with the UI, but I guess it's good enough. The script also got a little smarter about finding the replied-to comment. 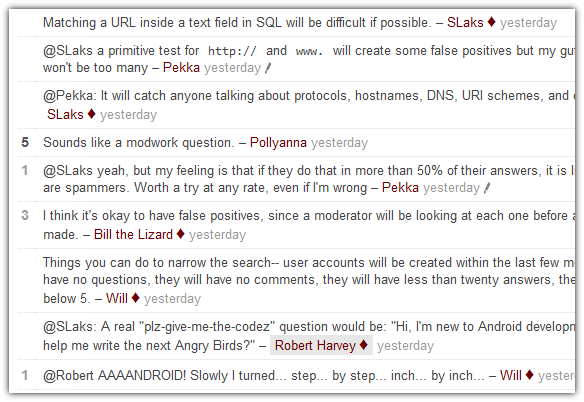 I have tested this script in Chrome (Windows 7), Chromium (Fedora 14), and Firefox + Greasemonkey (both OSes). This script is created by Benjamin Dumke-von der Ehe. Note that this is a free-time project of mine, and has nothing to do with my employment at Stack Overflow. See my profile for contact details; you can also often find me in the Tavern on Meta Stack Exchange chat. Very nice comments thread. Could it be made to display threads 1 deep (like Stack Apps basically does), and maintain the chronological order of the original comments? It seems like that, recently, it stopped displaying the @mention in threads. I'm using the following matches to run on all metas and also on SO in Portuguese. Area51 is matched by *.se.com/*.